My usual club partners were intrigued enough about the Altar of Freedom rules to give the Shiloh game another go: this time as an all day game. The verdict remains mixed. We used Terry’s 15mm figures again, put together on ad-hoc bases, about 8cm by 4cm in size. We played these using the standard distances for 6mm figures, where the the bases are usually 6cm by 3cm: which was no real problem. We were able to take a bit more trouble with terrain. I put together a felt cloth with masking tape painted in gouache tempera for roads and rivers (with a bit of gloss impast gel for the water), and felt patches for the forests. We didn’t have access to supplies of tree models, though. The small streams and hills were ignored as of not being of major significance for this rules system. 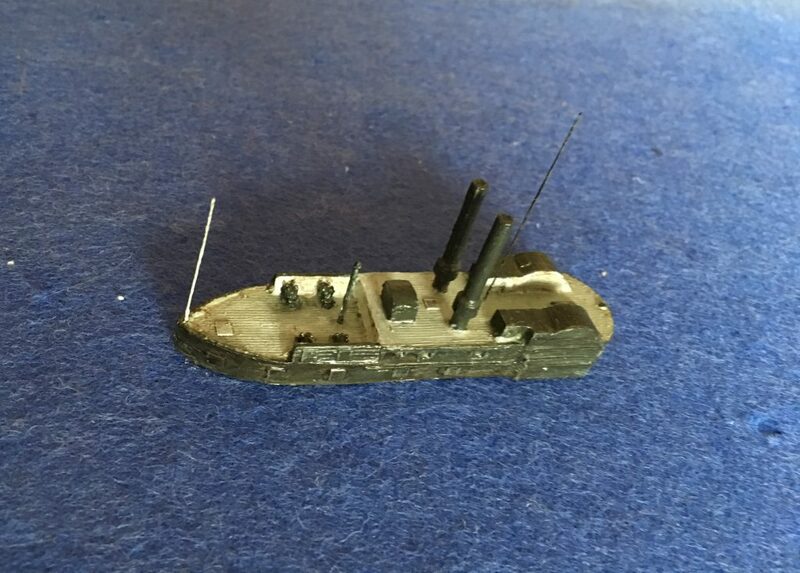 I even bought a 1/600 model of the USS Tyler at Salute and painted it up, which came out rather nicely. So the table looked much nicer, though hardly exhibition standard. We played the same teams of two a side as the original – I was part of the Confederate team with Terry, and Bernie and Pete taking on the Union. We started at about 10.30 am and finished after 6pm after 9 moves of the 11, with an adjudicated Union victory. The Confederates made better progress than in our first game. Our right, played by Terry, got quite close to the objective of the Pittsburg Landing, but they were flagging and the Union line was holding. My left tied down three Union divisions and steadily pushed them back, but did we put too much effort on that side? The Union strategy was to steadily retire and hold a coherent line. Only when their right had very little further ground to give did the fighting get really up to pitched battle level, and the Confederates were looking the more battered, although consistently being able to push forwards. So what of the rules? We were disappointed that the game did not play more quickly, as we had been led to believe from the blurb and one or two of the rules, though we were getting quicker by the end. The command phase, where the Priority Points are allocated, can be a bit tricky, and if two of you are playing as a team takes a little time. There are quite a few units to move around, and the turn system, which flips from one side to the other, can slow things down. BBB, the nearest rules set we have in scope, is faster, with fewer units, each side moving all its units together, and not allocation of PPs to manage. Overall we seemed to take about 45 minutes per move. The first moves took about 30 minutes, and our last moves were even quicker – so clearly there was some kind of an issue in the moves after lunch! We were getting the hang of the PP system, which is the most innovative part of the game. 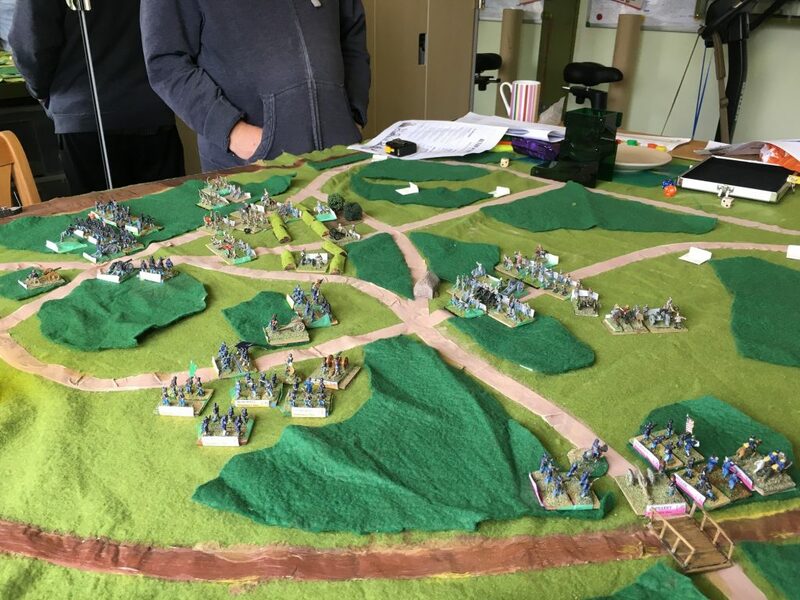 It is a clever evolution of the “PIP” system first made popular with the WRG’s DMB game, forcing players to choose which units to move and which to leave. As with our first game, the Confederates suffered with many more limitations on hows its PPs oculd be used – which was realistic enough. This pushed them into a broad front strategy, and nothing very clever was possible. It was very hard for the two corps which comprised two divisions to be able to move both their divisions in the same turn, and one of the two single division corps had a very limited PP ration. Another problem for them was that it was very hard for them to control the “turn clock”, which was therefore controlled by the Union side for all except the first and last move. That allowed them to run it down quickly, also limiting the Confederate options. However, by focusing on moving just three or four divisions in a single PP round, by giving them all three or all four PPs each, the Confederates could still get a lot done before the move closed (with four divisions on three points each that was definitely risky – so it was mostly three divisions on four). But this leads to one of the other criticisms of the game system. 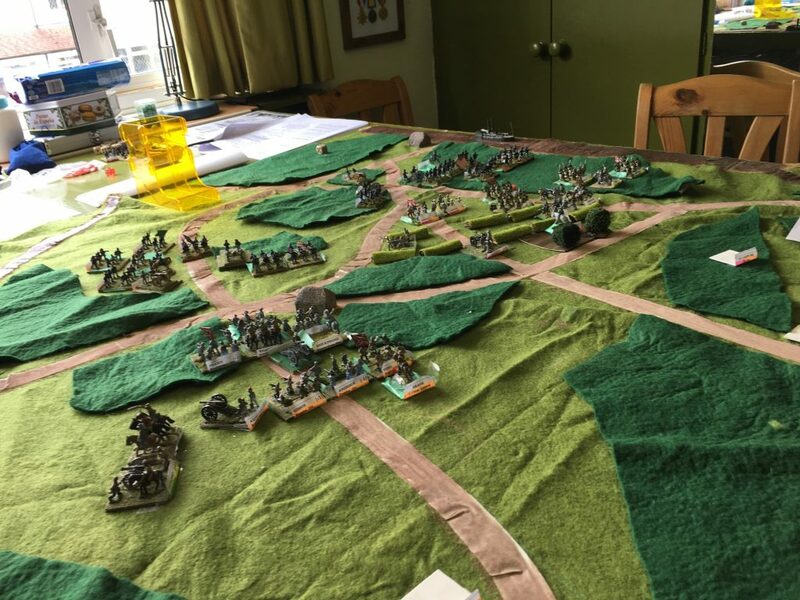 A lot of effort needs to put into crafting your bids – which is a bit of a distraction from the tabletop and does not closely mimic any real process of battle management. The movement and combat rules are very stripped down and simple. This is a bit abstract and generic, but that is a justifiable design decision given the focus on the command side. Though I’m no expert on the American Civil War, I think it actually captures the flavour of the rather loose ebb and flow of the era quite well. The main problem is that the rule book is too stripped down for my taste, and leaves too much unsaid, with only a short FAQ to help out, and no official online forum. So lots of details have to be worked out if players are unfamiliar with the rules, which clearly slowed us down. When can artillery interrupt advances to close combat? Can you shoot through narrow strips of woodland? If a unit starts on the edge of a wood, can it move at the full open-ground rate? And so on. Many rule writers (Iron Cross another case in point) deliberately keep the rule book short and loose, since adding extra detail makes the rules harder to read, and opens things out to rule-lawyers, as well as contradictions if you don’t do it quite right. I get that, but I don’t think these rules (or Iron Cross) get the balance right. We were able to settle down to a modus operandi, though I don’t think we got everything right. There’s only one thing I really don’t like and that is the total flexibility over movement and direction changes. Actually this works fine most of the time, but if a lone cavalry unit faces an isolated unit in the open, including another cavalry unit, it can almost always charge it in the flank (and without that unit being allowed to evade, as I found out afterwards). Also if a cavalry unit got into the rear, it is very easy for it to pick off generals even if they are in contact with their units. I can’t make too much of this. There aren’t many cavalry units (in this game one for Union, two for the Confederates), and moving them around requires command resources for their parent division. And historically they did harass rear areas. Flank attacks are easy in the rules by design – this is to liven up close combat, and in this context (i.e. the ACW) that’s fair enough. If I was modifying the rules, I think I would go down the BBB route of limiting direction changes during movement, but not as severely. So what is the verdict on Altar of Freedom? I have criticised the command system, but it has a huge virtue in being a hook to hang command characteristics of different armies on. The system invests a lot in giving different generals different characters, not only in PP allocations, but on how they may use them. These characters were in fact too much for us: none of us remembered the re-throws which different generals were entitled to. But for Shiloh it allowed the game to simulate the different command strengths and weakness of the two armies, which added a lot to the game. This would be very difficult in BBB. However this works less well in a multiplayer context. It is quite important that the different allocations from across the army are coordinated. Because of the turn clock it helps for the army to use as few different bid numbers as possible – unless you are deliberately playing for time and need to run down the clock. However this is problem with all variations of the PIP system of game management. Will we keep playing it? The time it took us was a bit discouraging. But we may well speed up, so I wouldn’t rule it out. If we do, I want to write down a number of game conventions to cover the vague bits in movement and combat, so that we are all agreed in advance. We were probably a bit too loose in this game – which tends to happen when you are making this sort of thing up in the heat of a game. One thing is for sure, though: playing AoF has added to my appreciation of game design!